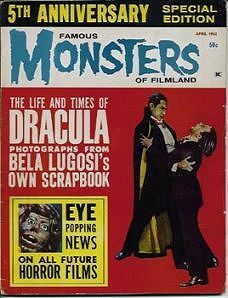 April 1963 issue of Famous Monsters featuring cover article on Dracula and Bela Lugosi. Fifth Anniversary special edition with minor wear. There is a small quarter-inch chip missing from the lower right corner of the back cover, otherwise this copy is excellent to near-mint. Bela Lugosi was born to play Dracula. He even grew up not far from where Dracula was supposed to reside. Unfortunately, Lugosi was type-cast as Dracula and was doomed to play horror roles for the rest of his life. He never completely mastered the English language, and preferred to speak Hungarian whenever possible. Many directors would not cast Lugosi because of his thick accent. Website design and hosting by Sohodojo Business Services. Item 148 of 466 items displayed in viewer. 0 items in cart.